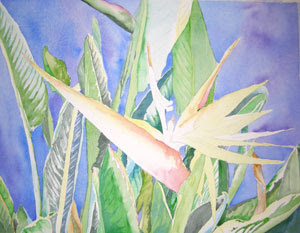 I am still working on the Bird of Paradise painting. I am now beginning to work with the second set of glazes. Note the second leaf from the left that comes up from the bottom edge of the picture plane. I had previously created some shading with other colors, including French Ultramarine Blue. Now I have added a glaze of Perylene Green, very wet. As different colors are glazed on top of one another, after the first layer has thoroughly dried, deep rich colors emerge! Now, I continue to glaze colors around the entire painting. Many times I will work with only one color where it is needed around the entire painting before I move on to another color. I am also adding yellow glazes over some of the greens, and a very wet Prussian Blue over other areas to push the warm areas and cool areas. At this stage, I want to be sure I am not totally ignoring an area of the painting that may not be as exciting or interesting to me as others. I love this stage as the glazes make the painting seem to begin to come to life! More to come. Visit soon to see the next stage - and soon, the final piece! 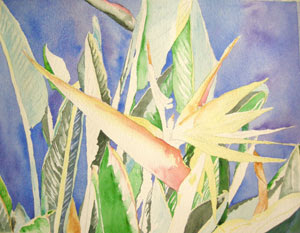 More information on my website: http://watercolorworksart.com.